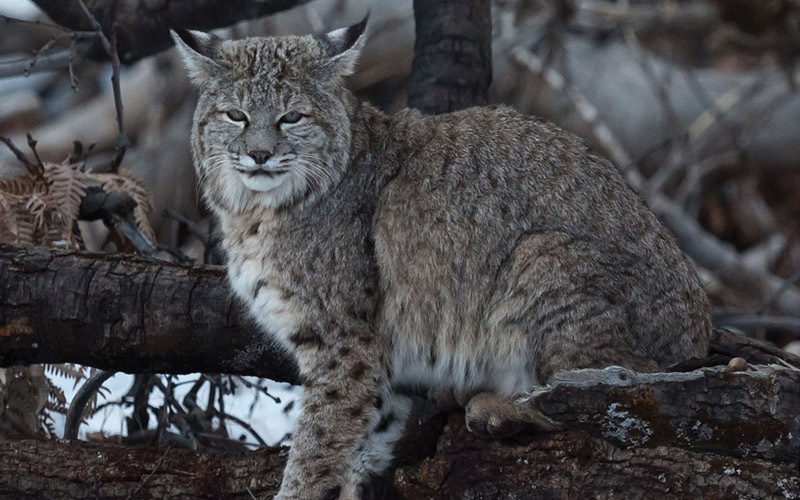 Bobcats are tawny (greyer in winter) with distinct dark spotting. They are short with a stubby tail and ears slightly tufted. They are born blind and weight up to 8 ounces. The kittens are born well furred and have spots that can vary in shape and design. Their habitat is primarily scrubby country or broken forests – hardwood, coniferous, or mixed; also swamps, farmland, and rocky or bushy arid lands. They are excellent swimmers but can also walk as much as 25 miles in a day. They are more active after dusk and before dawn. Bobcats are carnivores and prefer an all meat diet. On average they tend to live for 12-13 years.